Custom gifts that are more functional will enjoy a higher retention and consistent use among the recipients. 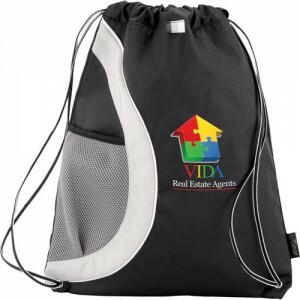 Drawstring bags are a perfect example of logo items that your recipients will use on a regular basis. The more the use, more will be the brand exposure for marketers. 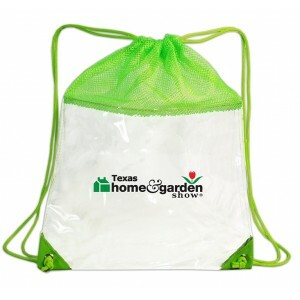 Drawstring bags are highly functional, simple and easy to use. To enhance its functionality, more features like pockets have been added in several models. In this blog, we are introducing a few such models that feature additional storage spaces and pockets. 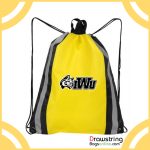 If you are planning to use custom drawstring bags as holiday promotional gifts, look no further than these trending drawstring bags with pockets. Check it out right away! 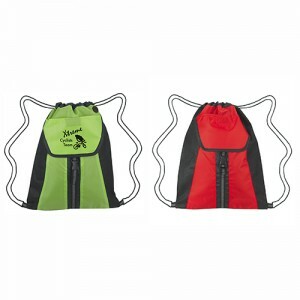 Arches Recycled PET Cinch Drawstring Bags: Made from 51% post-consumer recycled material, this drawstring bag has a spacious main compartment, pen loop and a front mesh beverage pocket for carrying bottles. It will make a great employee gift and holiday season gift. 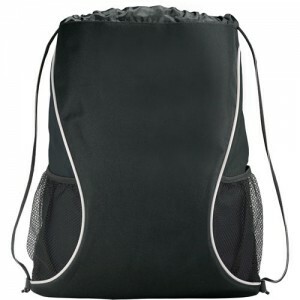 Crinkled Nylon Drawstring Backpacks with Vented Front Pocket has a unique design of air vented front zippered pocket along with the other features of drawstring bags like the single spacious compartment. This vented pocket will make a convenient way to store wet items while on travel. Marketers promoting adventure holidays, beach activities and outdoor events will find thesedrawstring bag a perfect choice. 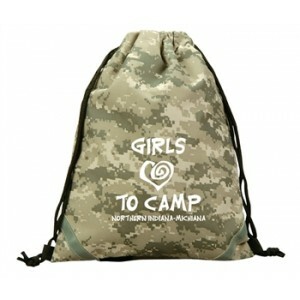 Digital Camo Drawstring Backpacks: These bags that flaunt and edgy digital camo design with reflective stripes will make a great bag for picnics, camping and other adventure activities. The backside pocket is another unique feature of this bag. Recipients can use it for storing ID cards and other small items. 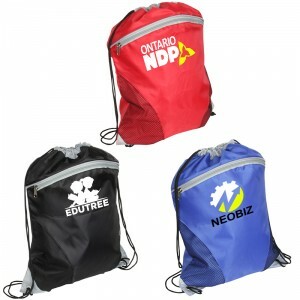 Imprint these attractive backpacks with your brand and message and see how these logo items will get your message out easily! Deluxe Reflective Drawstring Bags: The zippered front pocket is the unique attraction of these reflective drawstring bags. The open main compartment with drawstring rope closure will make it a convenient daily use bag for everyone. Personalize these with your brand and message and see how these logo items will make great tradeshow handouts and complimentary gifts. 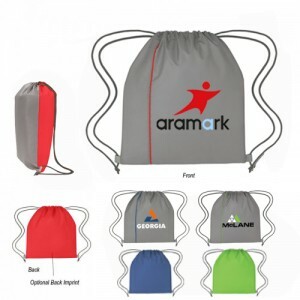 Cyclone Mesh Curve Polyester Drawstring Backpacks: This backpack not only offers large imprint space for logo, but also great storage space and boosts the style quotient of the user. The curved mesh pocket and the zippered front pocket will enhance its utility and storage potential. Great for promoting travel companies, sports leagues, beach events and more. 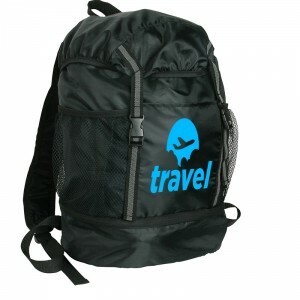 Funnel Polyester Drawstring Cinch Backpacks: The Zippered front pocket with ear bud port is the unique attraction of these drawstring bags. 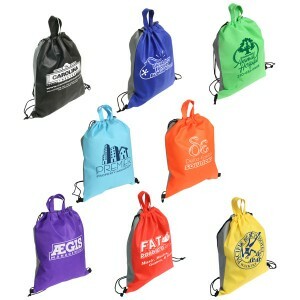 Designed to last long, these logo bags are well suited for traveling executives and people who lead an active life. Personalize these with your brand and message and see how these logo items will make your brand the talk of the town literally! 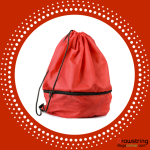 Boomerang Cinch Drawstring Bags: These drawstring bags that can be carried over the-shoulder or as backpack feature side mesh pockets, which make it a great toting option for anglers, beach holiday makers and campers. 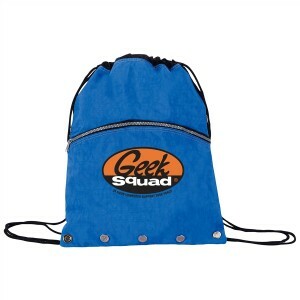 Imprint these handy bags with your message and brand and see how these logo items turn into your best brand ambassadors. 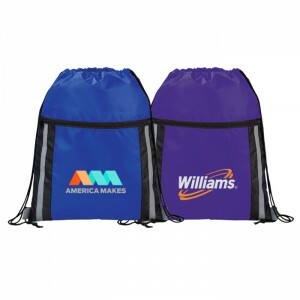 Drawstring bags with pockets will add double impact for your promotions. Make it part of your promotional mix and see how these logo items will earn a lot of attention for your brand.